Sheesh… Is the Trump administration trying to kill off the U.S. dollar’s status as the globe’s reserve currency? Yesterday during a conference in New York, Treasury Secretary Steve Mnuchin threatened sanctions against China if Beijing doesn’t carry out Washington’s wishes when it comes to North Korea. The gonzo financial website Zero Hedge ventured to say this amounts to a not-so-veiled threat to cut off China from SWIFT — the global payments network that greases the wheels of international commerce. Zero Hedge is prone to hyperbole, but in this case we daresay they’re not off the mark. If your nation has no access to SWIFT, your economy is toast. While SWIFT is based in Brussels, it’s the United States who calls the shots. In 2012, when Iran was at loggerheads with the United States and other Western powers over its nuclear program, Iran was cut off from SWIFT. Hyperinflation and bank runs followed in short order. To keep body and soul together, Iran’s government struck a deal with Turkey. Not that they made a big deal about it, but we managed to connect the dots here in The 5: More than 90% of Iran’s natural gas exports already went to Turkey. Meanwhile, Turkey’s gold exports to Iran exploded over a 12-month span, from $13 million to $480 million. When U.S.-Russian relations started going seriously south in 2014, several Russian banks were cut off from SWIFT. Russia too sought refuge in gold — the central bank drawing down its foreign exchange reserves to build up its gold reserves. The Russian gold stash has grown 44% in the last 3½ years. But China? China’s economy is 30 times the size of Iran’s… and nearly nine times the size of Russia’s. China can fight back. Twice this month, we’ve taken note of China’s plans to launch an oil futures contract priced in yuan and convertible to gold. This arrangement will be of immense interest to the globe’s two biggest “outcast” energy producers shunned by the West — Russia and Iran. It’s a sophisticated gold-based workaround that builds on the success Russia and Iran have already had after getting shut out of SWIFT. But it’s more than that. “This marks the beginning of the end of the petrodollar system that Secretary of State Henry Kissinger worked out with Saudi Arabia in 1974, after Nixon abandoned gold,” says our macroeconomic maven Jim Rickards. The system has worked like this: Saudi Arabia prices oil in U.S. dollars and uses its clout to get other OPEC nations to do the same. In return, the U.S. government protects the House of Saud and its allies against foreign invaders and domestic rebellions. Now all that’s at risk. Nor is the oil-gold link the only weapon China has in its anti-dollar arsenal. In May 2015, Jim Rickards ventured to the Pentagon to take part in a “financial war game” — the latest in a series going back to the first in early 2009, in which Jim also took part. “Our scenario,” he recounted in these pages at the time, “was limited to a confrontation between China and the U.S. involving disputed jurisdiction in the South China Sea.” China claims large parts of those waters. But so do Vietnam, Malaysia, Taiwan, Brunei and the Philippines. Washington has treaty obligations to Taiwan and the Philippines. Then again, the Chinese could attack the dollar with far more blunt force. Our national debt, which just surpassed the $20 trillion mark? China owns 5.7% of all those Treasury bills, notes and bonds. “All they have to do is not show up for a Treasury auction and all hell would break loose!” says our friend Chuck Butler, longtime keeper of the Daily Pfennig e-letter. Or how about a hack attack on one of the major U.S. stock exchanges? As Jim is fond of reminding us, Nasdaq never came clean about what shut down trading for three hours one day in 2013. Back to that financial war game in 2015: Jim said he learned two lessons that day. And they’re even more relevant now. “The first is that when nations engage in financial warfare, individual investors can be collateral damage. If China tries to attack the U.S. by closing the New York Stock Exchange, it will be tens of millions of Americans who will suffer an immediate loss of wealth as prices plunge and accounts are locked down or frozen. “The second lesson is that the financial war will be fought in cyberspace using digital technology applied to payments systems such as SWIFT, Fedwire, MasterCard, Visa and Europe’s Target2 system. To the markets: The major U.S. stock indexes are taking a breather after notching record highs yesterday. At last check the Dow and S&P 500 were microscopically in the red, the Nasdaq a bit more so. Gold is in retreat again, thanks mostly to dollar strength. The bid is down to $1,322. Depressing as that is in the context of $1,350 last week, the Midas metal is still higher than it was when it went into a swoon right after Election Day. Bitcoin is down to a one-month low of $3,862. Evidently JPMorgan Chase CEO Jamie Dimon’s remarks, noted here at virtual press time yesterday, were an excuse for some people to take profits. And why not? Two months ago, bitcoin was only half the price it is today. The notable economic number of the day is wholesale prices — up 0.2% last month, less than expected for the third month in a row. If the Fed is looking for signs of resurgent inflation to justify “tightening” monetary policy, they’re not in this report. 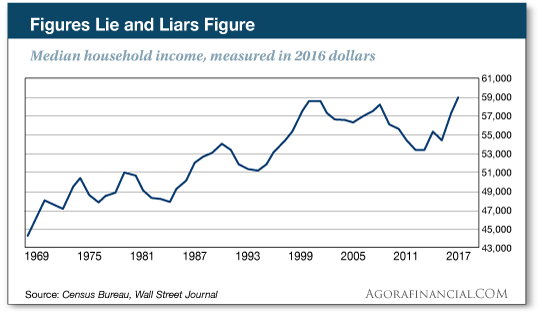 There should be a giant asterisk next to the mainstream headlines about median household income reaching its highest levels this century. The rest of the report is likewise loaded with caveats. The poverty rate is down to 12.7% — lower than 2008, but still higher than anytime between 1997–2007. And while more people have health insurance, the figures say nothing about the cost of that insurance or the quality of care it provides. If only hurricanes Harvey and Irma had struck a year ago: Then the cost of rebuilding might not be nearly as steep. As we mentioned in April, the Trump administration slapped a 20% duty on Canadian softwood lumber. Since then, there’s been an additional 6% “anti-dumping” duty. Indeed, the National Association of Home Builders says the tariffs have added $1,700 to the cost of a typical new home. “Your reader yesterday isn’t the only one who appreciates Beijing’s cashless society,” begins today’s mailbag. “No doubt WeChat is awesome, and there is nothing like it in the United States. “I just got back from living in Beijing myself and wrote this article listing the top apps available in the states to replicate that convenience. Nothing quite does the job, but one does come decently close. Now for an opposing view: “I am reading The 5 just an hour after getting some service done by a heating and AC service company. And the comment from the reader about the convenience of China’s electronic pay system gave me a chuckle. “When it came time for me to pay the service guy he said it was $85. I gave him one Benjamin, he gave me one Abraham and one Alexander. He was instantly credited, and I was instantly debited. Total transaction time roughly 10 seconds. The 5: Yeah, we’re not getting in the middle of this one today. We’re sure for the globe-trotting set, the convenience of WeChat et al. can’t be beat. Our cryptocurrency research team points out that in Southeast Asia, only 21% of adults have credit cards and 27% have bank accounts. But legions of them have smartphones. Little wonder that $50 billion in transactions run through WeChat every month. But no, there’s no privacy with electronic payments in a centralized system. In 2014, the Federal Reserve surveyed seven developed countries and found 82% of transactions in Germany taking place in cash; the U.S. figure was 46%. Don’t feel as if you’ve missed out: There’s no better time to speculate in the crypto markets. “Crypto-quakes,” as Lou Basenese calls them, are happening every few days. Look here for the next great opportunity.